Did you know that your Xbox One S™ can upscale 1080p gameplay to 4K UHD? Tests by independent users of video hosting sites like YouTube and Vimeo have shown that upscaling your 1080p content to 4K before uploading results in better image compression with less pixelation and artifacting. Even when you’re watching the 1080p version! Yes, you read that right. If you take your 1080p content, upscale it to 4K, upload it to YouTube, and watch it at 1080p, you will see better results than if you did the whole process in 1080p. AV.io 4K is the best (and only!) game capture card for true 4K video gaming capture. 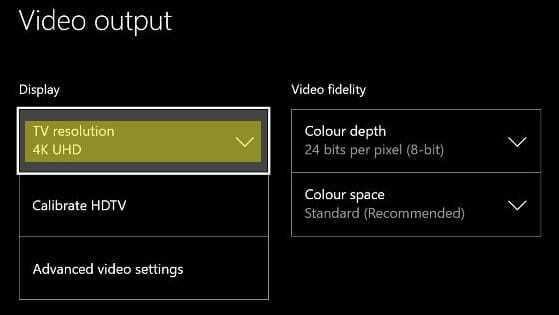 This tutorial goes through configuration and setup to upscale, capture and live stream 4K game play from your Xbox One S. Using these steps, you can choose to share to YouTube, Vimeo or any other endpoint that supports 4K UHD video. You can also choose to live stream game play to YouTube or any other endpoint with 4K live streaming support. Encoding and streaming 4K video involves significant processing power and optimized encoding settings. This tutorial was created using a computer running Windows 10 on an Intel i7-6770HQ CPU with an Intel Iris Pro Graphics 580, 16 GB of RAM and OBS Studio for encoding and streaming. A Microsoft Xbox One S™ (you could also capture from another console). The game or content you want to stream (you can also record games in HD, or Full HD with AV.io 4K). A capture computer, preferably with a dedicated graphics card. You can use a Mac, Windows or Linux-based computer – this tutorial uses a laptop running Windows 10. AV.io 4K, Epiphan’s easy to use 4K video grabber (updated to at least firmware 3.2). A 4K capable HDMI splitter to send the HDMI signal to both the capture device and your TV. Two extra HDMI cables for the splitter setup. A 4K display or 4K TV for viewing/playing your video game. Network connection with lots of bandwidth for streaming. Do I need to use a splitter? Like Epiphan’s other video grabbers, AV.io 4K has an extremely low capture delay: usually just one frame! Your encoding software and available computer processing power can add to this delay. Some games, like PvP shooters or sports games, require superior accuracy and don’t tolerate even the slightest bit of lag. For these games, you may find you prefer to play while watching on a TV instead of the video capture screen. Using a 4K HDMI splitter lets you accomplish this. Using the instructions that came with your Xbox One S, connect the power supply cable and network cable to your Xbox One S.
Connect the HDMI cable that came with your Xbox One S (or with your AV.io 4K) from the HDMI OUT TO TV port on your Xbox One S to your AV.io 4K. Power on your Xbox One S.
For shooters in PvP and online play or for sports games, you may find you play your best if you use a 4K HDMI splitter to also show your Xbox One S on a 4K tv. Connect the HDMI cable that came with your Xbox One S from the HDMI OUT TO TV port on your Xbox One S to HDMI IN port on your 4K HDMI splitter. Connect a third HDMI cable from another HDMI OUT port on your splitter to your 4K TV. The following steps assume your system is powered on, that your AV.io 4K is receiving an HDMI signal from your Xbox One S, and that your AV.io 4K is connected to a USB port on your capture computer. If you’re not using a splitter, you may want your computer’s speakers or headphones to play your Xbox One S audio so you can listen while you record game play footage. 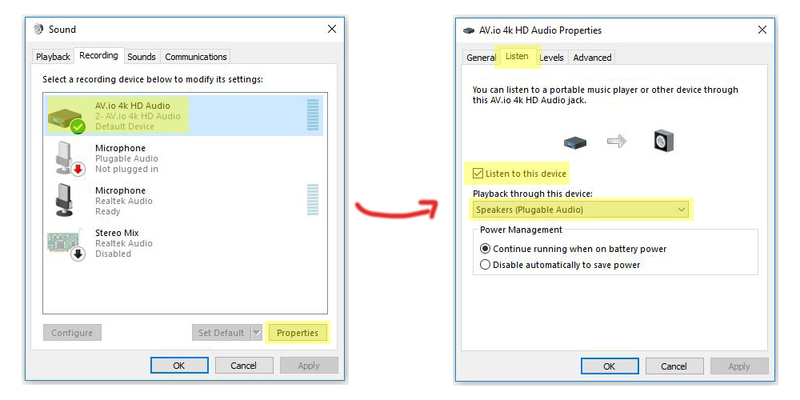 On Windows 10, you can can configure this through the Sound control panel. Click to select AV.io 4K, then click Properties; the properties dialog for AV.io 4K opens. From the AV.io 4K HD Audio Properties dialog, select the Listen tab. Make sure Listen to this device is checked. Choose a playback device from the dropdown, and click OK.
Test audio by playing your game or other content on the Xbox One S.
We found some surprising results in a side-by-side comparison of videos captured with OBS and with the built-in Microsoft Camera application. The 4K 30 fps mp4 files created with Windows Camera were better than we could obtain with OBS. And encoding them put less stress on our system CPU. Therefore this tutorial takes advantage of the Windows Camera tool to effortlessly record beautiful game 4K UHD video game play. In the Windows Camera application window, make sure your AV.io 4K video capture card is the selected camera. If needed, click the camera button at the top left corner of the screen to make Windows Camera step through your list of available cameras. Of course, there are encoding programs that offer more flexibility than Windows Camera. If you like, you can follow the directions for 4K game capture and live streaming using OBS in our 4K PS4 Pro tutorial. Start at step 4. Xbox One S outputs video in 1080p by default. The settings menu includes an option to upscale video to 4K UHD. You need to ensure this feature is enabled to capture 4K video. Using a controller paired with your Xbox One S, double-tap the Xbox button. Go to Settings > All settings, and then choose Display & sound. From the Display & sound menu, choose Video output. On the Video output screen, select the TV resolution drop down menu and choose 4K UHD. Return to the Xbox home screen. By default, Windows Camera encodes video at 1080p, so AV.io 4K downscales the 4K video from your Xbox One S to 1080p. It’s easy to change this in Windows Camera, and AV.io 4K immediately stops downscaling and forwards the 4K signal directly. Click the gear icon in Windows Camera (top right). From the Videos section of the settings, click the Video Recording drop down and select 3840x2160p/30 fps. Click to the left of the Settings section; it closes and saves your change. You may also need to toggle whether Windows Camera records screen captures or video. If Windows Camera shows a big video camera icon and a little traditional camera icon at the right side of the screen, there is nothing to do. If Windows Camera shows a big traditional camera icon and a little video camera icon at the right side of the screen, click the video camera icon to toggle recording video. Step 5: Play and record! Launch your game and get ready to play. When you’re ready to start, click the video camera icon once to start recording; the button becomes a red stop button. When you’re done, click the red stop button once to stop recording. Unless you changed where Windows Camera saves files, your new video game recordings are in your Pictures\Camera Roll folder. You can now share your recording by uploading your gameplay video to YouTube, Vimeo or any other CDN that supports 4K! 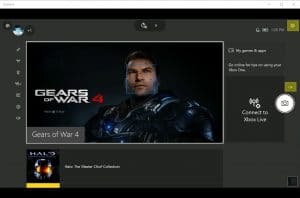 Here’s our Xbox One S recording from Gears of War 4 (upscaled to 4K UHD on an Xbox One S) that we captured with AV.io 4K and the Windows Camera method described in this article. Windows Camera works really well for making a high quality video game recording. 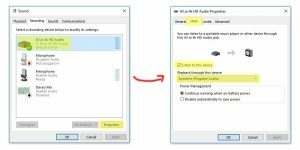 But if you’d like to add your own voice-over, stream directly to YouTube, or modify settings like bitrate and file format, you may want to use another encoding application. You can follow our 4K PS4 Pro tutorial to see how we’ve done this with OBS. Start at step 4. You are now video recording live 4K gameplay (or HD gaming) from your Xbox One S! And your new video game captures will look great online, regardless of whether your viewers watch in 4K or 1080p. You’ll be racking up the views and the shares across social media.